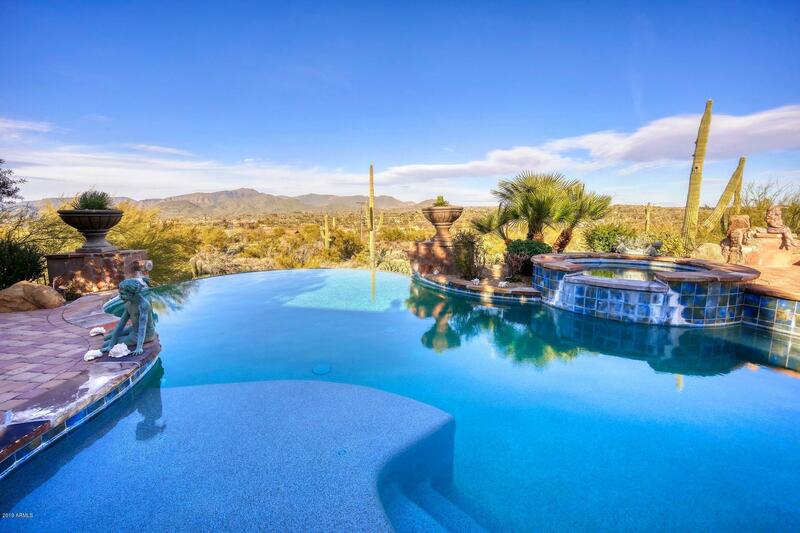 Built with a camera in hand, this beautiful custom home has views from every angle! The moment you walk into the massive great room w/sliding pocket doors you will be impressed with the high ceilings, attention to detail, and level of finishes throughout. From the gourmet kitchen w/SS appliances, slab granite, & 42'' raised panel alder cabs to the massive master bedroom w/... the negative edge pool and barrel ceilings through out, this home is stunning!! A master closet and walk through shower that are only offered with this level of luxury living.The detached guest house and views will make your guests never want to leave. NEW items: Kitchen granite, Mater bdrm A/C, inside light system, wine cooler in kitchen, fixtures in kitchen & master bath, heater for pool, exterior paint. Truly an art to see if you are looking for a unique luxury home!